8FOOTSIX: I would love to tell you about what I am reading! I would love to tell you about what I am reading! Are you kidding, this is my favorite question of all time/these days. 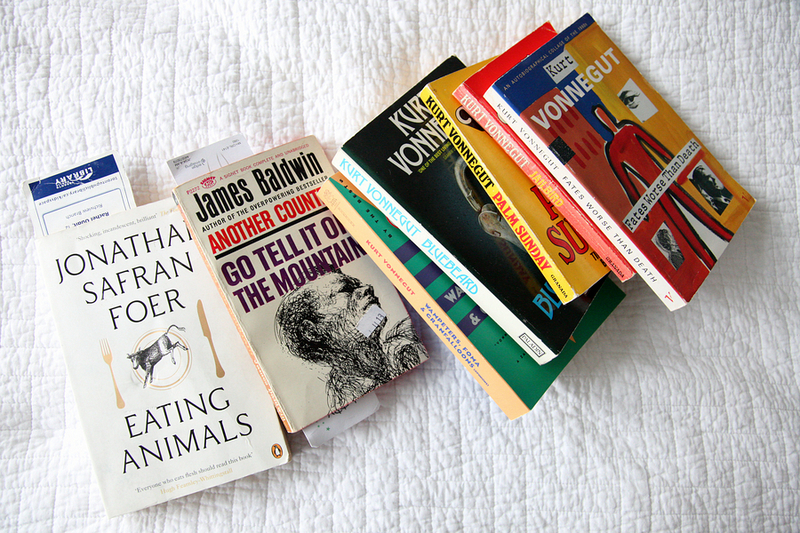 Yesterday, I started reading two books, James Baldwin's "Go tell it on the Mountain" and Jonathan Safran Foer's "Eating Animals". I rated "Slaughthouse Five" (one of my favorite novels of all time), "Welcome to the Monkey House" and "Mother Night" five out of five stars (on Goodreads). The only book I didn't get into was "God Bless You, Mr Rosewater" (It was ok). I appreciate Vonnegut's wit. He sees through society's bull crap. Watch him express his opinions on Youtube - you will be hooked! BUT, I needed to step away for a while when his stories started to tangle together (overlapping characters and themes), and I developed my very own old-man-chip-on-my-shoulder. He is part of the reason I dropped the Internet. (Kids these days, jeesh!) So, I read Douglas Adam's "Watership Down" to cleanse my palate - who doesn't love little bunny stories (five stars, fantastic book!). After her Celine Ad came out, I read a few Joan Didion books. I started with "Blue Nights" (not for me), then "A Year of Magical Thinking" (Who is this b*tch?). Then I wanted to see for myself how she earned legend status and checked "Slouching Towards Bethlehem" out of the library. Ah, ok, I gave it four stars. I fell in love with her essay, "Goodbye to all that", and I am not surprised to hear they are making it into a movie. I read the "White Album" too, and then had my fill. Instead of reading Didion, I switched to her list of recommended books. I gave Hemingway's "A Farewell to Arms" a second reading (loved it again), and two days ago finished Orwell's "Down and Out in London and Paris". The James Baldwin I am currently reading is on that list. Otherwise, you will find me reading about food, catching up on Time's List of Top 150 English Language novels of the Twentieth Century (I've read 76/150), reading books I should have read by now (Sherlock Holmes, for example), and reading what friends have recommended: "Paradise Elsewhere" by Kathy Page was haunting, and I put "Big Little Lies" by Liane Moriarty on hold at the library, I bought a used copy of "Rebecca's Tale" I am excited to read. You can find me on Goodreads. I don't write up reviews of the books I've read, I only rate them.